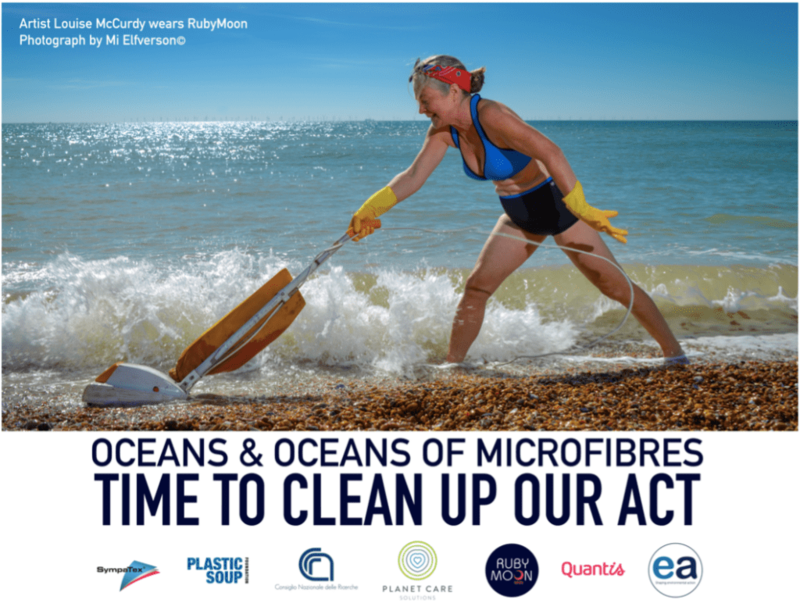 Ocean Clean Wash is a campaign initiated by the Plastic Soup Foundation in 2016 in order to tackle one of the biggest sources of plastic pollution in our oceans: microfiber release from synthetic clothing. Synthetic clothes make up to 60% of the whole clothing material used worldwide. When washed, and due to friction and washing conditions, clothes release microplastic particles that go down the drain and pass undetected through waste water treatment plants. Microfibers are also released in the air through wearing of clothes and household textiles such as curtains and carpets. The problem of synthetic microfiber pollution is complex and of a considerable scale and switching from synthetic materials to organic materials comes with other substantial environmental costs. Therefore, Plastic Soup Foundation decided to campaign to address this problem and involve all the players: washing machine manufacturers, fashion brands, environmental organizations, and consumers. For over three years, the Plastic Soup Foundation was the dissemination partner on the Mermaids Life+ research program about synthetic fiber loss during machine washing. The scientific findings were published in Elsevier’s Environmental Pollution Journal on 13 December 2017 ‘Evaluation of microplastic release caused by textile washing processes of synthetic fabrics’. After the termination of the Mermaids Life+ project, the Plastic Soup Foundation launched the Ocean Clean Wash campaign with the goal of finding solutions to one of the biggest sources of plastic pollution in our oceans. In 2016, Ocean Clean Wash gathered more than 100 supporters from around the world, including NGOs, scientists, and well-known individuals. In order to take the lead in this fight and to put pressure on the clothing industry in such a way that all stakeholders are involved. In 2018, the campaign has taken a new direction and is determined to reduce up to 80% of microfiber emissions from synthetic clothing in the coming years by closing the loop of the fashion industry. In order to do this, stakeholders from all steps of the value chain have been asked to gather in a coalition that will explore, promote and find solutions in all the steps of the product life cycle. The logo of the Ocean Clean Wash was designed by the famous graphic designer SIT from Amsterdam. In 2018, the Plastic Soup Foundation, in collaboration with the Italian research institute IPCB-CNR, tested synthetic clothes for the loss of microfibres in the washing process. The results were presented at the fair trade ISPO in Munich on February 4th. “This is what you call fast fashion. It disappears in front of your eyes”, said Maria Westerbos, director of the Plastic Soup Foundation. To learn more about the role of water and plastics across the fashion industry, Fashion for Good gathered more than 100 fashion enthusiasts in Amsterdam to ask industry experts: “How to Clean up a Dirty Industry”. For more details about the event, read the report on Medium. In order to do this, we have gathered stakeholders from each stage of the product lifecycle that has shown interest in working on and promoting solutions. Together, they form the Coalition of the Willing. The workshop brought together up to 20 stakeholders in the fashion industry from all around the world. The parties involved in the workshop covered all steps of the value chain so as to discuss the current research on microfiber pollution from synthetic clothes and the solutions & opportunities to solve it through collaborative action. Maria Westerbos, director of the Plastic Soup Foundation, gave a presentation during SAC’s Annual Meeting in Vancouver. She presented the preliminary results of the tests of big four brands on microfiber loss from synthetic clothes. She also highlighted the gravity of the problem in terms of the health consequences of human contact with plastics as well as urging the fashion industry to take responsibility for the problems the clothes they produce cause. Swedish EPA and Swedish Chemicals Agency hosted a dialogue meeting within the three-year initiative “Dialogue for a sustainable textile value chain with focus on environment and chemicals”, in Gothenburg, Sweden. Plastic Soup Foundation participated in the panel discussion organized during Ocean Film Festival: A Wave of Change, in Brussels, and discussed the issue of microfiber pollution from synthetic clothes. Plymouth University, Klean Kanteen and A Plastic Ocean also participated in the discussion. Plastic Soup Foundation participated in the discussion and Q&A “Fashion’s Deep Water Impacts” at the Worth Ethical Apparel Roundtable Conference 2017. Mermaids Life+ research paper was published: Evaluation of microplastic release caused by textile washing processes of synthetic fabrics, by De Falco, F., et al., in the magazine Environmental Pollution. Meeting with scientific experts and discussion of the next steps in Capri, Italy, during the International Conference on Microplastic Pollution in the Mediterranean Sea. Maria Westerbos, director of the Plastic Soup Foundation, was the moderator of the discussion. Generation of a steering group of organizations to lead the fight against microfiber pollution from synthetic clothes. Expert workshop and press conference “Fibres from synthetic clothing disastrous for mankind and the oceans”. The final reports by Mermaids Life+ are available to the public. Plastic Soup Foundation and Parley for the Oceans Form Alliance to end Plastic Microfiber Pollution Through “Ocean Clean Wash” Campaign. Dr. Sylvia Earle, worlds most famous Oceanographer, is present to support the campaign. Plastic Soup Foundation presents the Ocean Clean Wash campaign during the summit as well as its 100 supporters from all over the world. Plastic Soup Foundation and G-Star RAW sign the Ocean Clean Wash Charter to stop the release of plastic microfibers from synthetic clothing. In 2016, Plastic Soup Foundation launched Ocean Clean Wash campaign to fight against plastic pollution from synthetic clothes. We gathered more than 100 supporters from around the world, including NGOs, scientists, and well-known individuals, in order to take the lead in this fight and to put pressure on the clothing industry in such a way that all stakeholders are involved.